A blog about Travel Photography, Landscape Photography, Wildlife Photography, Urban Photography and Photography Tips. The first blog post about Travel Photography. I have been looking for some time now for the article I wanted to start the blog with. I knew it had to be something that had to with travel photography. I thought of writing about one of my past and most exotic travels, my trip to Morocco or maybe the amazing experience I had in Scotland, since the photographs from these countries are some of my favorites. But a recent trip to a place not far from home changed all this. For those of you who follow me on Instagram, you will have seen the recent trip I had at the villages near Grevena, Greece. Located at the Western part of Greece, Grevena is a small city of approximately 14.000 residents. While the city itself does not offer any spectacular sights, the nature around it is truly breathtaking offering some amazing opportunities for anyone who is interested in photography. My friend’s parents come from a village up the mountains near Grevena called Lavda so when he told me he wanted to visit his grandparents I immediately agreed to come with him. We had been at the place a few years ago and I remembered that the landscapes around the village were staggering. And that was the main reason I wanted to go there. To capture the breathtaking landscapes that the mountain ranges of Pindos had to offer. I wasn’t disappointed. The mountain peaks were playing hide and seek with the clouds. The mountain ranges lay in front of us showing us their beauty. We saw landscapes covered with fog. 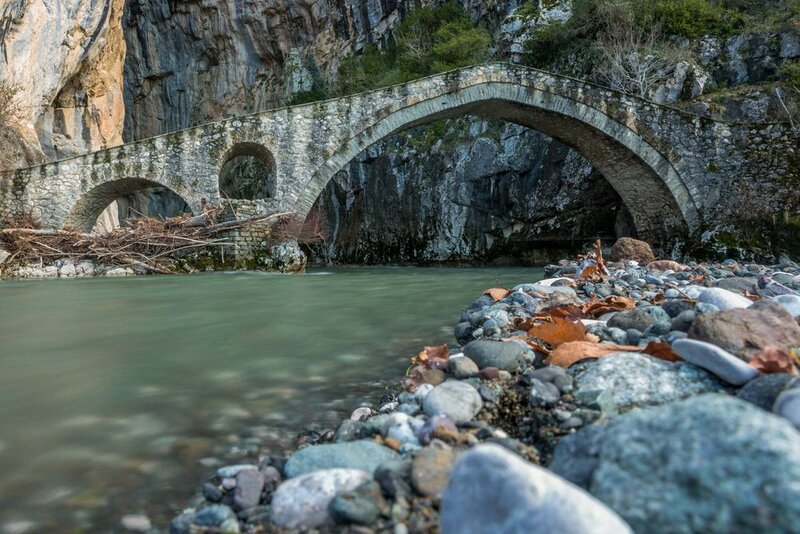 Stone bridges and rivers with emerald waters. A night sky full of stars. Beautiful wild horses, living free on the mountains of Pindos. After all these beautiful scenes we saw I thought that my photographic appetite had been sated. Our stay in the village though, made my lense get interested in another subject. One that I didn’t have to go far to capture, nor climb mountains or hike for hours. That subject was my friend’s grandparents and the life they led. He has told me a lot about them and the following 3 days I spent time observing them, looking at how they live their lives. Their habits, traditions, opinions. They are simple people, that live from the earth, growing their own fruits and vegetables. They have their own goats and sheep, taking care of them and using their milk, cheese, and meat to live. They have no need for fancy cars and clothes. A couch by the fire and a warm plate of food are enough to make them happy. Being nighty years old they have lived in an era that we can’t even imagine and faced difficulties that we probably never will. Their hands are hardened, full of scars from the hardships they had to endure to make a living in this inhospitable place. Grandma Chrisoula, the brains of the house. Grandma Chrisoula is 82 years old and yet she is one of the most sharp-witted individuals I have ever met. Being able to make jokes, give suggestions, advice, and comment on modern social issues she truly amazed me with her clarity. Be it the clean air or the pure, drug-free food they eat, there is definitely something that has helped the people of these villages retain their cognitive status. Always kind, warm and inviting she made our stay there unforgettable. She wears a glove on her right hand because she had a stroke 15 years ago and she can't move it anymore. That makes her story even more inspiring since she is still able to do all the chores that are needed to run the house. Clean, cook, feed the animals, help Grandpa with his daily chores and after all that she still had the mood to make jokes and conversations with us. This incredible woman is living proof that age is just a number, not an excuse. Grandpa Euthimis, the muscles of the house. Grandpa Euthimis is responsible for the house's heavy-duty jobs such as cutting wood for the fireplace and carrying heavy bags of supplies for the winter. He may look rough but he is kind and warm, always inviting us to join him at the table and share stories from his service in the army. My friend's family used to own almost 300 hundred goats and sheep and grandpa Euthimis was responsible for taking care of them, guiding them up the mountains to find fresh grass to feed. Being 90 years old now, he can't do that anymore but that doesn't stop him from still being active and having the ability to do most of the chores that are needed to run their home. I was actually amazed, by how much strength and energy he had, having seen other elders of his age. Hardened and strong this man was and still is the muscles of the house. 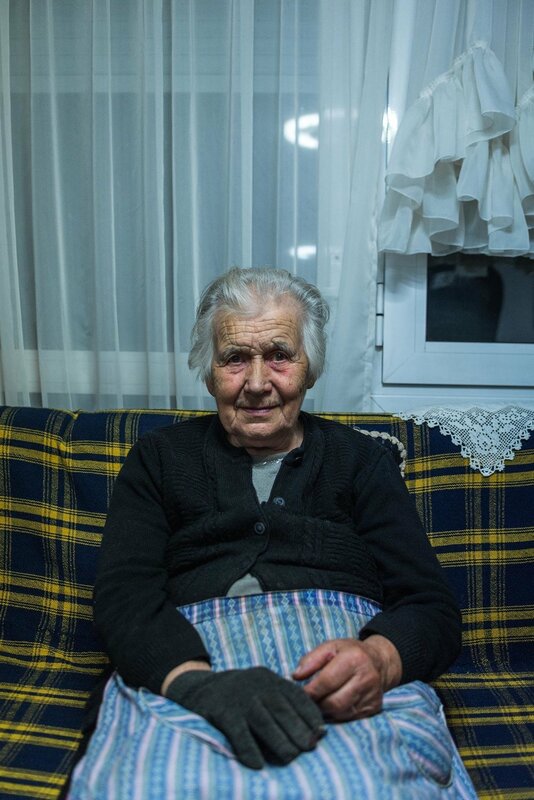 Grandma Zacharoula, the one who got left behind. Grandma Zacharoula is the sister of grandpa Euthimis. As it was typical in these years you had to get married to leave your family home and start your own. Grandma Zacharoula didn't find a husband so as tradition required it, she lived her life with her brother and his wife. Her calm presence was always welcome and this photograph of her portrait is one of my favorites so far. 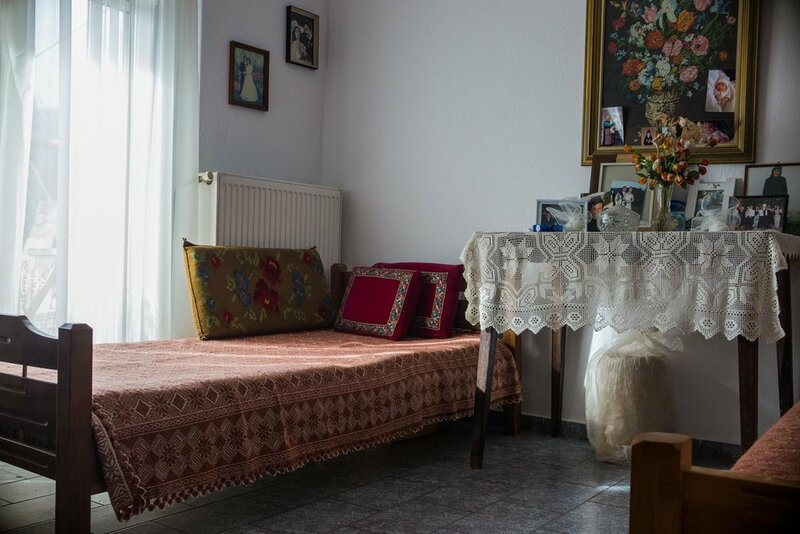 One of the house’s rooms filled with family pictures and traditional greek hand-woven textiles. Old metal heater, also used as a stove. The metal heater is the heart of the house, located at the living room and constantly burning wood to keep the house warm. It is also used to boil water for tea or cook food and can be seen in many traditional houses in the villages of Greece. The family gathers around it to watch TV, discuss or greet guests. An apothecary built by the family to store supplies for the winter. The house’s apothecary used to store food, tools, and supplies. Onions left to dry in the apothecary. Grandpa Euthimis takes his small herd of 5 goats around the village so the animals can feed on fresh grass. Grandma Chrisoula, watering her plants. Wood, stored for burning through the cold winter that is about to come. Grandma Chrisoula with her grandson and my friend, Euthimis. We spent three amazing days at the village of Lavda in Grevena, Greece. Three days that made me further realise how much I love photography and its necessity in sharing the beauty around us. The beauty of nature through landscape and wildlife photography and the unique stories of the people you meet along your journeys. 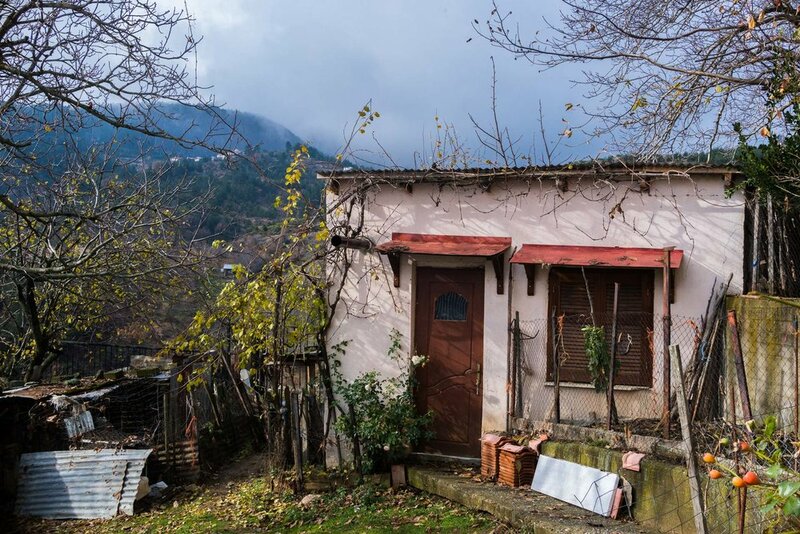 I hope that through my photographs you experienced how life is in these Greek villages which are lost in time and whose people lead lives very different from our own. This is the first of many articles to come, about the places and the people I see and meet in my adventures, as I use photography to capture the world’s beauty, one shot at a time. Sign up to receive news and updates about new photos and blog posts. We respect your privacy. No spam, no boring stuff, just a minimal, informative email from time to time to stay in touch with our latest content.